This series of engagement photos taken in various parts of Toronto has one thing in common: in all of them, the light was phenomenal. Also, we shot in the best photography locations in Toronto. Even though those settings are popular tourist attractions, with patience and bit of luck we were able to achieve amazing results. 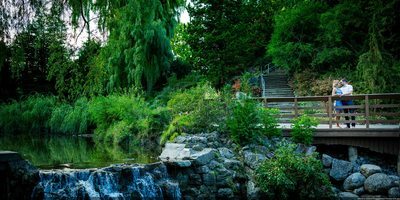 We first started our engagement photo shoot at Toronto Botanical Garden, also known as Edward Gardens. In the summer, Edward Gardens is extremely crowded with tourists and locals. Everybody is trying to snap a picture of the flowers and plants in the garden. The most challenging aspect of this section of the engagement portraits was to keep the couple relaxed in front of so many passersby. Being romantic in front of such a high number onlookers takes a lot of skill, but Katerina and Taylor did an amazing job. One would think we managed somehow to close the Edward Gardens to the public for the purpose of this engagement photo shoot. Truth be told, we asked a few couples if they could move so we can take our shots and they did not mind. 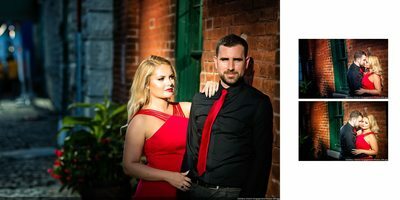 Most people in Toronto are nice and allowed us to shoot, especially when we told them we were taking their engagement portraits. As Katerina bought these amazing Sophia Webster "Wifey for Lifey" sandals, we stared taking photos of them first. When I saw the images on the back of my camera, I knew we would create great pictures that day. After that we took photos around the garden and after about 90 minutes, we finished the first part of the engagement photo shoot. We divided this engagement photography session in two parts to take advantage of the beautiful sunset light at various locations. The following day met in Ramsden Park, just across from Rosedale Station. 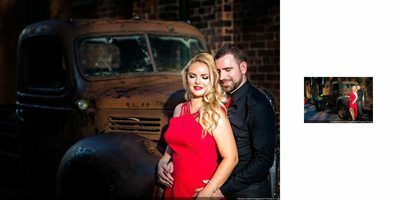 What I love about that downtown Toronto location is that is extremely close to Yorkville and offers a large variety of backgrounds, which allows the engagement images to look like they were taken at different locations. Afterwards we moved to Yorkville where we hit the lighting jackpot. While we were walking on Hazelton Lane, I noticed a unique beam of light in the middle of the street. The sun was hitting a glass skyscraper and was reflected back. 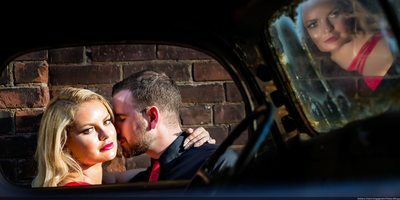 The couple were sandwiched between two beams of light and looked like they were lit with professional strobes. That is one of the reasons why downtown Toronto is my favourite spot to photograph engagement sessions. One can find such a variety of locations and an amazing quality of light from the sun bouncing around the buildings. That light dance allows me to snap a variety of images in a relatively short period of time. Distillery district is among the most popular Toronto wedding and engagement photography locations. What I love about Distillery district is that this block was built like the developer had a photographer's list of must haves. Its beauty is given by the heritage buildings. There are several pieces of art that look good in the pictures. 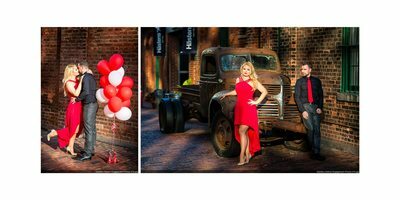 For engagement photo shoots, there is a huge red heart just at the Gristmill entrance coming from Parliament St. Also, there is the Love Lock Fence where, similar to Paris, lovers can lock their love. Finally, the multiple coffee shops and restaurants, the terraces and patios give the quarters a romantic atmosphere. However, I don't recommend photographing in Distillery District on weekends as it is extremely crowded with tourists and taking one perfect engagement shot can take ten to fifteen minutes. As the photography permits allow two hours of shooting, you can imagine how many photos the couple can expect. In this case I had to be creative and I shot using my beloved Canon 85mm f1.2 which is a splendid lens. 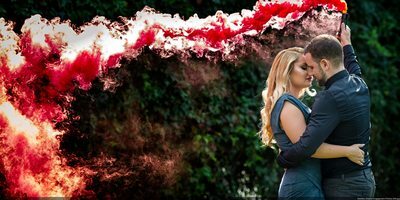 It isolates the subject and blurs the background and that was what we needed for this part of the engagement photography session.